While strain gage is the most common weighing technology because of it’s good accuracy and lower costs, force motor has become the alternative for high precision weighing. Yet this second technology has some innate flaws and a high cost that make it a less than ideal solution. Purchasing managers and industrial engineers have often had to make a difficult trade off between cost and accuracy, but that’s where our new weighing technology comes into play. Let’s explore each technology so you can decide which one best meets your weighing needs. This design has become the industry standard over the last half a century. When the shape of the resistor (in this case the strain gage) is allowed to change, the resistance value also changes. Strain gages are generally manufactured from a flat foil material, shaped into a long serpentine path and carefully bonded to a spring element called a load cell. The load cell bends when weight is applied to the platform, which changes the shape of the gage and consequently increases its resistance value. Four strategically placed strain gages will typically be applied to the spring element and wired together to form a Wheatstone’s bridge. This bridge is an electrical circuit that measures the unknown electrical resistance of the gage and turns it into a voltage output. The voltage produced by the bridge is passed through an ADC (analog to digital converter) and the digital signal is sent to the scale’s display where you read the weight of the object you’re weighing. The precision of a strain gage scale is affected by several factors, especially the fact that the scale’s resolution is tied to its capacity. So higher capacity scales that use this design aren’t as accurate as lower capacity ones. A load cell is not a perfect spring. A perfect load cell doesn’t exist because it would have to be a perfect spring, bending in perfect proportion with the weight applied to it. When the weight was removed, it would return to its exact starting position. But a spring with unlimited bending potential will eventually undergo plastic deformation and lose the characteristics that make it a good spring. Kind of like the Slinky you handled too roughly as a kid that never returned to its perfect coil or worked how it was supposed to. Strain gages are not perfect resistors. In an ideal world, a change in length would be the only thing that caused the resistance of a gage to change. But resistors exist in the real world where many other influences come into play. Fluctuating temperatures are the largest cause of error, but microscopic abnormalities in the gage material and simple age can also introduce errors. Adhesives limit the spring characteristics of the load cell. Quality manufacturers bond strain gages to the load cell using a very thin, smooth layer of glue. Yet even the most careful application is never perfect simply because glue has no spring characteristics and restricts those of the load cell. This means that the exact bending of the load cell can never be transmitted to the gage. The conversion from analog to digital signal can also introduce errors into the final measurement. This design was introduced when it became clear that businesses needed higher precision measurements than strain gage scales offered. Instead of a load cell, an electromagnet is used to support the weight of the platform an anything on it. Weight is measured by determining the amount of electrical current required to keep the platform balanced. While this is an intrinsically more accurate way to determine weight, it’s also expensive and prone to error. Like strain gage scales, fluctuating temperatures can introduce error into the process. 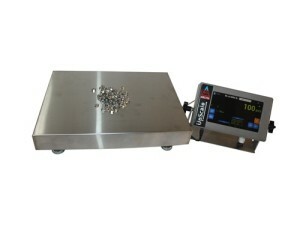 The accuracy characteristics of these scales change over time, so manufacturers will apply an internal calibration mass to the sensor to reduce these errors. Yet this significantly increases the cost of the scale and requires regular, even daily, recalibration in order to maintain accuracy. Another major concern is that force motor scales are impractical at higher capacities. More electrical current would be required to support the platform or increasingly expensive and complicated systems would be required. That’s why the vast majority of these scales cap at a 25-pound maximum capacity, which isn’t very useful in high volume production and other industrial tasks. The transmission of bulk wave between a transmitter and receiver that are a known distance apart will take a predictable amount of time. When the distance between them changes, so will the time it takes to transmit the wave. So instead of measuring resistance or opposing force, our new weighing technology — called surface acoustic wave, or SAW — uses time measurements to determine weight. This is a pretty revolutionary idea because it allows us to measure weight using a spring element load cell, which is cheaper to manufacture, without the disadvantages of the strain gage design. SAW load cells do not depend on stress or strain in the spring element, which means these forces can be reduced by at least 90%. Normal load cell errors are therefore reduced to an immeasurable level. These time measurements are automatically produced in a digital format, which makes them inherently more accurate. Since no resistors are used, the innate issues with the strain gage design — like the ADC and bonding technique — are also eliminated. SAW technology is currently available on bench and counting scales in capacities ranging from 5 to 500 pounds. We’re currently working on applying this technology to higher capacity scales of 1,000 pounds and higher. Our Ultra Precision Scales are ultimately able to give you much higher accuracy than strain gage scales at a similar cost. Higher capacity SAW scales are actually about two-thirds the cost of a force motor scale and the accuracy is at least as good, if not better — even at higher capacities. We’re currently expanding this technology to other industrial scale models including our cylinder, drum and floor scales. Experience the difference SAW technology can make. Order an Arlyn Ultra Precision Scale today.